Roush CleanTech has developed a medium-duty electric powertrain for Class 6 and 7 trucks, the first non-combustion offering from the Michigan-based company. The prototype, a box truck on a Ford F-650 chassis, was unveiled Tuesday at the 2018 ACT Expo green transport conference in Long Beach, Calif.
Roush CleanTech, an arm of engineering and product development specialist Roush Enterprises, of Livonia, Mich., has long been a proponent of propane autogas and compressed and liquefied natural gas engines as alternatives to diesel power for trucks. The decision to develop a battery-electric system came as customer inquiries and requests grew, Rob Stevens, engineering vice president for Roush products, told Trucks.com. Demand “is in the hundreds, not thousands, but we expect it to grow,” Stevens said. Roush “has invested $50 million in the last 10 years, building a foundation to help customers move away from diesel…This is the next step,” said Todd Mouw, Rosch CleanTech’s president. Electrified trucks are “what the market is asking for,” he said, noting that the price of diesel has risen by 54 cents a gallon in the past year to a national average retail pump price of $3.06 a gallon. In California, where many of Roush’s EV-seeking clients are based, diesel averaged $3.83 a gallon on Tuesday, up 88 cents from $2.95 a year earlier. Testing and regulatory certification demands mean it will be 18 to 26 months before a commercial version of the battery-electric powertrain is ready for market, Stevens said. The initial powertrain can be used with Ford’s F-650 and F-750 chassis, targeting the regional delivery truck and school bus markets, but Roush intends to develop battery-electric systems for other medium-duty classes as well, Mouw said. The F-650 prototype is fitted with a mid-chassis electric motor driving the rear wheels via a short driveshaft. The motor draws power from a series of four lithium-ion battery packs with total capacity of 150 kilowatt-hours. Peak output is rated at 335 horsepower – 250 kilowatts — and continuous operating power at 200 horsepower, or 150 kilowatts. 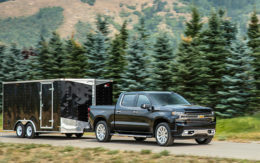 The truck has an estimated range of up to 120 miles per charge and a top speed of 75 mph. Batteries are the costliest component in an electric vehicle. Roush believes that battery prices, which have fallen significantly in the past decade, will drop even further as more and more car and truck builders add electrified powertrains to their portfolios. “We were paying around $1,000 per kilowatt” when he was running Ford Motor Co.’s Think electric city car program, Stevens said. Now the cost is as low as $200 per kilowatt, he said. Roush is joining a number of players in the medium-duty electric truck and bus market and has some catching up to do. Competitors include BYD, Workhorse and Daimler’s Fuso unit. The Fuso eCanter electric delivery truck already is on sale in the U.S., and California-based BYD North America is marketing electric school buses and delivery trucks. Workhorse has begun testing Class 2 electric delivery vans, and UPS has announced plans to lease 50 Class 5 electric trucks the Ohio-based company is developing and expects to have ready by the end of the year. “Now is the time to jump in,” Roush’s Stevens said.